A bold, black design sets the Summit E-420 Grill from the rest. It's made to last and built to perform. The lid features a centered thermometer to read the inside temperature of the grill for pre-heating and cooking. Pick up your new grill from Cofer's Home & Garden today! For the ultimate in convenience, Summit Gas Grills come with 1 Grill Out handle lights. It has a built in censor that will put the spotlight on the food when the lid is opened. There is ample space below for an LP tank and/or for you to store your BBQ tools and accessories. 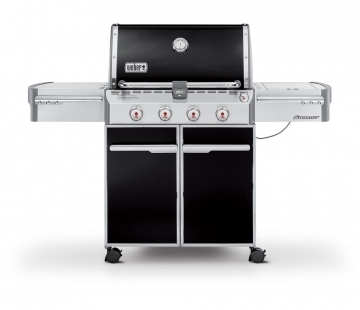 This grill has two large stainless steel work surfaces that flank both sides of the grill. Also included - a backlit LED tank scale to show you where you stand with your fuel. The 12,000 BTU per hour side burner makes this grill a complete cooking space. The burner is large enough to accommodate sauté pans as well as sauce pans.